As expected, the Economic Community of West Africa States, ECOWAS, is been pushed into starting a war in Gambia. The move to begin a military confrontation in Gambia is been spearheaded by President Muhammadu Buhari of Nigeria, who was selected as the chief mediator between out-going president Yahya Jammeh and Adama Barrow, the winner of the December 1, 2016 presidential poll in Gambia. President Yahya Jammeh is expected to hand over power to Adama Barrow on January 19, 2017 but has stated he will not allow the inauguration of a new president for the country. Earlier, Yahya Jammeh had conceded defeat after the result announced Adama Barrow as the winner of the presidential poll, but he quickly changed his mind of handing over power after news filtered in that he will be put on trial by the new president. I do not plan to hold brief for the Koran-carrying Yahya Jammeh because that will be a waste of time for an Islamic fundamentalist. Most Africa country is being led by either religious fanatics or octogenarians without thoughts for the development of their country but the intention of amassing wealth and becoming dictators. 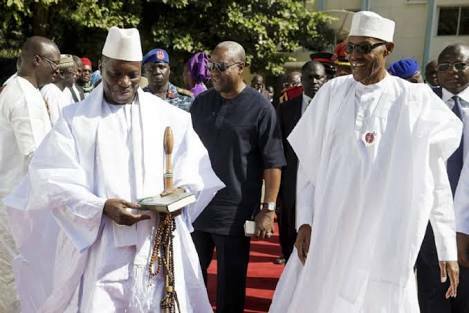 Just like Muhammadu Buhari, Yahya Jammeh has no respect for the constitution of his country. It is quite myopic for ECOWAS to select Buhari as the chief mediator in Gambia even when he has severally disobeyed court orders in his own country Nigeria. Buhari has trampled on both the Judiciary and the Legislative arms of government in Nigeria in his bid to continue his tyranny over the citizens. The octogenarians in ECOWAS might have been hoodwinked by Buhari into selecting him as the chief mediator in order for him to look relevant in the eyes of the global community. Buhari is known to be unreasonable and incapable of leading a dialogue. His penchant for violence is undisputed as he is responsible for provoking the 2011 post-election violence after he lost the presidential poll, which gave rise to the recruitment of young Moslems into the Islamic terrorist group, Boko Haram. Global human rights watchdog, Amnesty International, has also indicted the Nigeria security forces who were under strict directive from Buhari, for the extra judicial mass killings and violence against peaceful Biafrans and Shiites. It does not surprise me that Muhammadu Buhari cannot convince Yahya Jammeh to uphold a peaceful transition of government but has rather convinced Adama Barrow to flee Gambia to enable a forceful transition via military actions. ECOWAS must be wise in dealing with the situation in Gambia as military action is not assured to bring lasting peace to the country. Yahya Jammeh has held on to power for a long time and has turned into an institution in the country which means taking him down from power through military action will never be an easy task. There are suggestions that Yahya Jammeh has the backing of some foreign governments who have promised him finance and mercenaries in the case of invasion by the ECOWAS forces. Even as the Supreme Court in Gambia is yet to begin hearing on the election petition filed by Yahya Jammeh due to lack of court judges, he has ordered military equipment all over the streets of the country’s capital, Banjul, and other parts of Gambia in readiness for the ECOWAS forces. I do not support the continuous hold to power by Yahya Jammeh but every peaceful effort must be exhausted before violence is initiated. The innocent citizens of Gambia will bore the brunt of the violence if military action is taken immediately. Buhari is purposely stalling the importation of court judges from other West Africa countries to hear the case which is usual with Gambia Judiciary. Gambia lacks competent Judges and depends on its West Africa neighbors for its Supreme court cases but Buhari prefers a military action to a court hearing. The happenings in Libya should be a case study to any right thinking person, any military action in the tiny West Africa country will affect neighboring countries as the influx of refugees is already on the rise in Africa. ECOWAS must reiterate its desire of achieving a peaceful transition in Gambia by appointing a new chief mediator with morals and a respecter of rule of law unlike Muhammadu Buhari. Buhari is a propagator of violence who prefers killing and blood shedding to dialogue. Africa is already a hotbed for crisis and ECOWAS must not allow itself to be used by Buhari to begin a fresh one in the Western part. The citizens of Gambia are more important than Yahya Jammeh and must be considered first before any military action begins in their country. Every other means of sacking Yahya Jammeh must be exhausted before Gambia is invaded by any military force. Muhammadu Buhari and Yahya Jammeh must not be allowed to use the lives of innocent Gambians to exhibit their pride. BIAFRA'S! AR U DAT DAFF & DUMB? Wat is Nigeria's foreign policy? Is buhari d ECOWAS chair? U guys can go to hell 4 all I care. Prove 2b intelligent.